The importance of a ‘Juvenile’ or ‘Juniors’ Program was evident at an early time in the Department’s history, and one means of generating interest was the formation of a ‘Juvenile Fire Department’ as approved by the Department at the September 10, 1945 Meeting. The Ladies Auxiliary donated $200.00 and each Department member was assessed $5.00 each with the total to be raised of $1,000.00. The group would be limited to 50 members and would have their own By-Laws. First Assistant Chief Rudolph Hahn was put “in full charge of Juveniles” by Chief William Schork in 1946. This was primarily a Musical Unit which marched with the Department at parades. Lessons were provided by a High School music teacher and each member received $1.00 for each parade attended (as per Honorary Chief George Clancy who was a member at that time). There was no firefighting training provided to those in this group, and it was disbanded in the mid 1950’s. In October of 1964, Ed Miller, Sr. was appointed as a ‘Committee of One’ to look into the formation of a new ‘Juvenile Fire Department’, but no action was taken at that time. No more discussion was held regarding a Junior Program until December of 1974 when a Committee was directed to investigate the formation of a Junior Fire Department. This consisted of Deputy Chief K.O. Jackson, Tom Doyle, Bob Hamilton, Herman Hugo, Douglas ‘Boots’ Masterton and others that would include Ted O’Brien (known to all as ‘O.B’). The Central Islip Junior Fire Department was officially organized at the December 1975 Department Meeting with 48 members accepted. Meetings were to be held on the second Friday of every month. 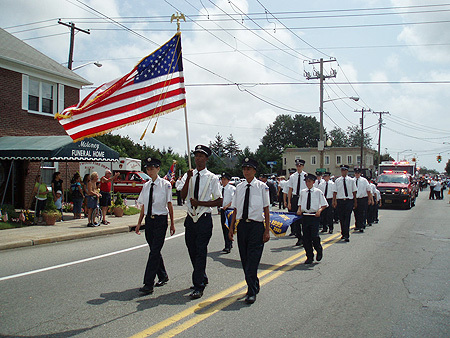 The Juniors participated in their first parade on Memorial Day in May of 1976, and their first parade with the Department was in Lindenhurst the following week. Their first tournament participation was also the next day, in Lindenhurst. The first of many annual Installation of Officers Dinners for the Juniors was held on November 5, 1976 at the Fire House. Members were granted approval to join the Fire Department at the age of 17 provided they had at least two years of service with the Juniors. Bill Cordingley and Robert A. (Bob) Miller were the first members of the Juniors to join the Department in February of 1978. Bob Miller was the first member of the Juniors to serve as Chief of the Department (from 1998-2000). The Junior “Hoboes” sponsored the New York State Junior Drill for the first of many times in 1978 at the track facility at Station #2. Juniors’ member Jim McMullen, Jr. was presented with a plaque for action taken at a fire in a neighbor’s home in August of 1979. The Team has been very successful in Drill Team competition winning over 40 drills in their history, and by capturing a total of eight New York State Championships – 1980 @ Sea Cliff (which was also the Team’s very first Drill Team victory); 1989 @ Central Islip; 1999 @ Hagerman; 2000 at Center Moriches (Ridge); 2001 @ Lindenhurst; and 2005 @ Hagerman, 2008 @ Selden, and 2009 @ Hagerman. The Central Islip Junior Fire Department (“Junior Hoboes”) has been a very successful part of the Department’s development since its’ inception, and the current Team of over 30 members continues to develop their skills, hoping someday to join the ranks of the Central Islip Fire Department.